... 1891 (120 years ago today), Zora Neale Hurston was born in Notasulga, Alabama, the 5th of 8 children whose father was a preacher-carpenter-farmer and whose mother was a schoolteacher. She grew up in Eatonville, Florida, the 1st all-African-American incorporated town. (credit for Library of Congress image of Hurston visiting Eatonville in 1935) Hurston started college at Howard University, then accepted a scholarship to Barnard College, where she was the only African-American student. After earning an anthropology degree there, she was a graduate student at Columbia. 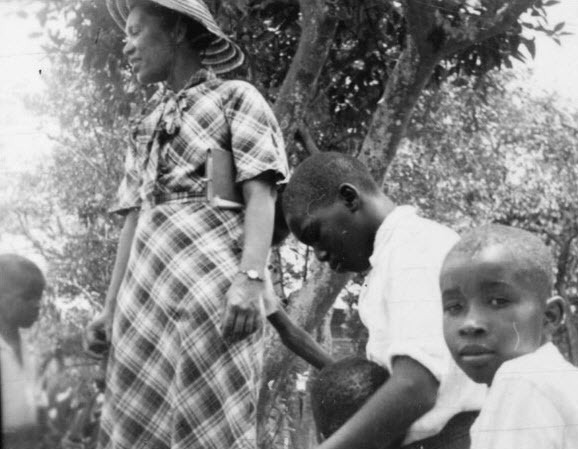 As IntLawGrrl Hope Lewis has written, Hurston became an "anthropologist of Black cultures in the southern United States, Haiti, and Jamaica." Hurston taught at what's now North Carolina Central University, and established a dramatic arts school. She also wrote, "four novels and more than 50 published short stories, plays, and essays"; indeed, she was a principal writer during the Harlem Renaissance. Among her most noted works is the novel Their Eyes Were Watching God (1937). In 1955, she published a letter decrying "ruling of the U.S. Supreme Court" in Brown v. Board of Education "as insulting rather than honoring my race." Hurston died at a welfare home in 1960, and was buried in an unmarked grave.